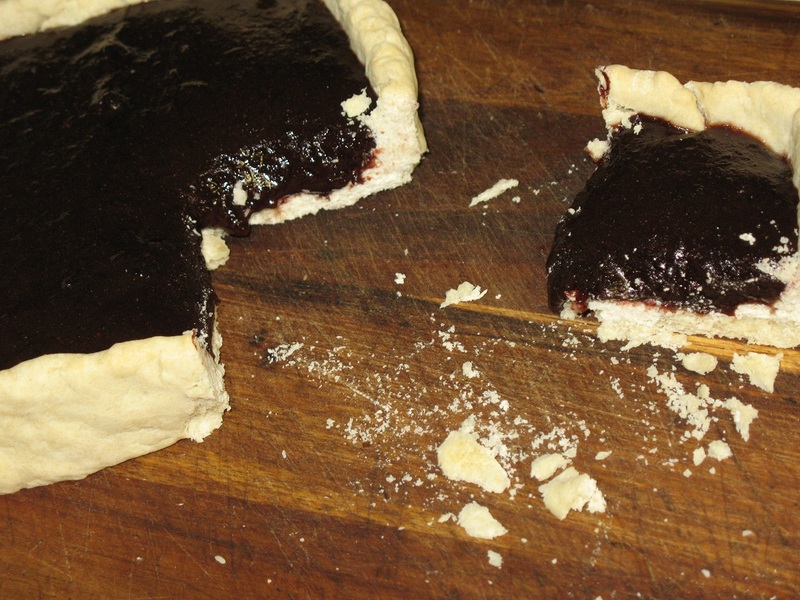 Well the combination of the filling and the simple pastry worked out an almost perfect combination. With these I opted for a dense pastry just because I wanted to practice hand building pastries, as opposed to using a pan to create it's shape and would say that the last ratios I used worked out very well for a nice dense pastry (a short, that is a very soft pastry full of butter, will not hold it's shape well and collapse while baking, especially if baked empty). Of course, if I was willing to fuss more, I could have made it neater. As you can see, they are not very big, it all came down to only having 28 plums. Of course I could have made a slightly larger squared pie or round one... maybe 8 inches or so with the amount of filling I had. Here you can see just how well the paste holds once cooked, you can also see just how rough a job I did on forming it... I'll admit that it was done somewhat hastily. The kitchen was also somewhat cold which will shorten the usable time to play with the stuff before it gets too hard. In this last picture, you can see what it would look like with a chunk sliced out of it. 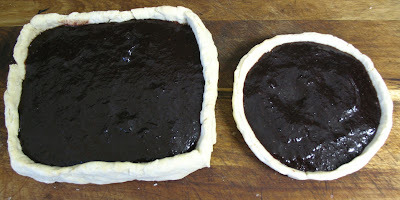 I would say the paste was twice as thick here as it was in the round pie and the round one held up just as well. The major reason why this one was bigger is that I found it harder to roll out the paste so stopped a bit earlier than I probably could have. Even with the thick, dense, paste, I found it still enjoyable to consume along with the filling. Yes, it is most certainly edible. 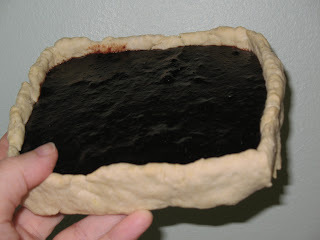 The filling also set quite nicely as well, as you can see... only changes I would probably make is to maybe add yet another full teaspoon of each spice to it, but, even still, it was quite tasty... if I had my own plum trees, I'd certainly make a large batch of these for any feast. Without that, they are probably not so economical but fine for a smaller dinner.